This student had a lot of courage to stand up to his teacher and fellow classmates. He made me think how I wish I had had the courage to do the same. Starting in 7th grade, I started getting depressed for no reason. 25 years ago there was still a huge stigma with mental illness. In fact, I had thought people who suffered from depression were weak and crazy. I felt like here I was, one of those crazy people! I would cry during class and could not concentrate on anything. I could not sleep at night and didn’t enjoy anything I normally would. Eventually, my parents allowed me to stay home when I sunk into this deep depression. I would miss two weeks of school and could not function at home either. I could not even do simple tasks like vacuuming. I would eventually come out of my depression and go back to school. I would them make up two weeks of school in 2 or 3 days. It is now believed that those were mini manic episodes. My junior year in high school, I had my first full-blown manic episode and was admitted to a psychiatric hospital. If people didn’t think I was crazy crying and missing so much school, I thought for sure they would think I was crazy then. I had one good friend who came to visit me in the hospital and remained my friend. Unfortunately, she moved away. I did make friends rather easily, but then would miss school and those friends would have moved on. I remember that I often would sit in the guidance office and eat my lunch there because I felt like I had no one to sit with at lunch. I ended up going to a different high school and had a fresh start. I did make some new friends, but I kept it a secret as to why I would miss school, etc. I believe that the stigma has gotten a little better. However, I know that kids are still criticized, bullied, ridiculed, and made to feel like what is wrong with them is something they can’t talk about or admit they have. It saddens me to think that our suicide rate is rising and so many people are uneducated or misinformed about mental illness. I wish more politicians, media, athletes, musicians, actors, and actresses would stick up for these kids. If they would help to stomp out the stigma and help to educate others, more people would feel comfortable sharing what they are experiencing. Also, more people would go get the help they need. Often people don’t get the help they need because of the stigma. 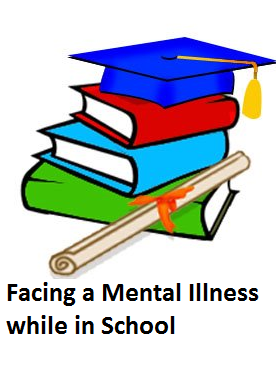 If you want to help, write to politicians, famous people, and the media to let them know more needs to be done to help the mentall ill in our schools. Having a mental illness is not something that you should be ashamed of. If you know someone who is suffering with a mental illness in your school, reach out to them and show them that you don’t judge them and do care. If you are witnessing someone being bullied because of their mental illness, stand up for them or at least tell an adult. This entry was posted in Uncategorized and tagged bipolar disorder, bullying, depression, manic, mental illness, Mental Illness Awareness, stigma, stigma in our schools. Bookmark the permalink. Nice project, it’s a fantastic post. The advice is good to know! Actually, it usually occurs in our environmental; nevertheless I am grateful to this post because it shows good distinction.